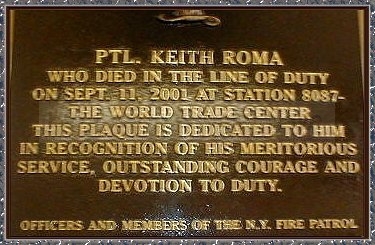 This Memorial Plaque was dedicated to Keith on 9/11/2002 at Patrol 2 in the Village. Keith was seen several times, helping groups of victims to safety from inside the South Tower. Many trips later, the South Tower fell and Keith made the ultimate sacrifice, along with the last group of civilians he tried to save.. after being listed as missing, Keith was recovered on Christmas Eve.